The italian company can offer an "always awailable" on-site support of Grifo radars on Draken's L-159E ALCA fighter jets. 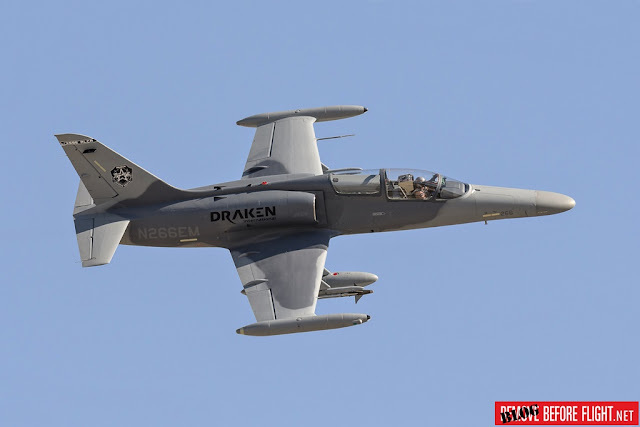 Leonardo offers to support Draken International during USAF combat exercises. Following an initial trial with flight services provider Draken Internationalin 2017, Leonardo has proven the viability of a new ‘always available’ support contract business model. Leonardo’s new model uses the company’s support, logistics and technology expertise to ensure that all assets are available whenever they are needed. Traditional support contracts provide a certain level of availability, with military end users expecting gaps for repairs and guaranteeing an asset’s availability via spares and their own logistic backbone. The company expects its new model to be a hit with service companies such as Draken International who are paid by-the-hour. Leonardo has been partnering with Florida-based Draken over the last few months in their delivery of ‘adversary’ training for the U.S. Air Force Fighter Weapons and Tactics School at Nellis Air Force Base in Nevada. A key part of USAF training involves simulated combat against real jet fighters, in this case L-159E ALCA fighter jets provided and flown by Draken to represent ‘enemy’ jets. Leonardo have been supporting the ‘Grifo’ radars on-board these jets. Because Draken are a service-based contractor who in this case is paid for flying by the hour, they need all their radars to work all of the time; i.e. ‘always available’. Leonardo has now proven their ability to deliver this level of support and the two companies are in talks to sign a multi-year support deal. The mechanically-scanning Grifo radars were previously provided by Leonardo for the Czech Air Force and installed on L-159E ALCA fighter jets, 21 of which were subsequently acquired by Draken. During training with the USAF the radars are flown at a ‘wartime rate’, meaning that they are constantly heavily employed over a sustained period of time. This consistently heavy usage requires high-performance support provision to keep the radars flying. Leonardo expects the ‘always available’ model to be an attractive prospect for other service companies who are paid by-the-hour and cannot afford for their assets to be out-of-service. The company is gaining prominence for its service offerings which include the high-profile support of Italian Air Force Typhoons (known as CMA) and its avionics support for UK Royal Air Force Typhoons in partnership with BAE Systems. Underpinning this support capability is Leonardo’s expertise in radar technology. The company has sold over 450 Grifo radars which together have notched up more than 150,000 flight hours with the air forces of five different countries and one commercial service provider, Draken International, which uses the radars to provide critical air-to-air combat training to the US Department of Defense. The latest version of the Grifo radar, featuring optimised performance, is also being integrated onto the Leonardo M-346 Fighter Attack aircraft, which is under development. As world leader in the training sector, Leonardo with its M-345 and M-346 can cover the entire pilot training syllabus. This unique range allows the training syllabus to be tailored to the requirements of pilots assigned to flying with any Air Force. A complete Ground Based Training System (GBTS), perfectly integrated with the platforms and able to ensure both high quality training and strong operating efficiency, complements the aerial platforms.